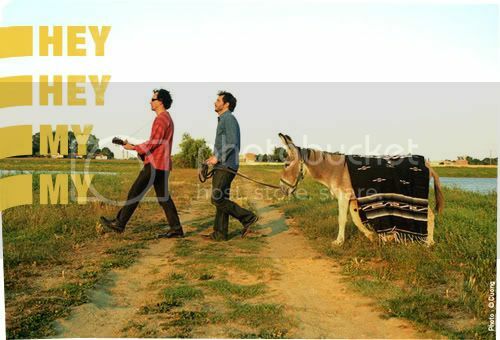 Hey Hey My My is a French folk-pop duo whom both answers by the name of Julien (Julien Gaulier and Julien Garnier). Not only do they share the same name, but also an interest in music, which went on to seal their music undertaking together as a band. The two piece is currently sharing the same label, Sober & Gentle with this other French duo, which I’ve previously mentioned (remember them?). Their self-titled debut released last year, contains some of the most irresistible tunes that are closer to delightful pop melodies than simple folk music. One track from the album, called ‘Morricone’ features a guest singer, Audrey Pic from Swedish band, Envelopes, who takes on singing duty full hand. Muted guitar plucks that gently tip toes across the melancholic music, garnished with the sleek lilting vocals, unravels a sweet and spare tune with a distinctive stillness that underlies the song. Towards the end, you’ll hear the sound of the ticking clock, and someone’s breaths from a deep sleep-- it’s all somewhat mystical at the same time. Earlier this month, the band released an EP entitled A True Story, featuring five songs of the catchy, pleasant folky kind and composed of ridiculously impressive hooks alongside laidback melodies, creating a wondrously heartstring-tugging combination. Hey Hey My My certainly confirms itself as one of the most treasured finds this year.